Tree: Visalia 3B, 9 inch swell, wood post horn, 3 1/2 inch cap by 3 1/2 inch high, shovel cantle 4 inches high. 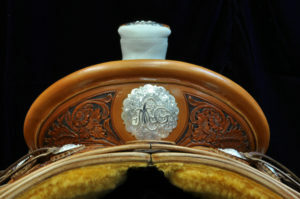 ¾ inlaid quilted seat, Rich burgundy color with red stitching, regular roll cantle binding. Medium square skirts with 2 1/2 inch radius corners. California half double stirrups leathers and fenders, quick change stirrup leather buckles, 4 inch wide monel bell stirrups with quarter covers. Mule-hide horn wrap; hobble carrier; and hoof pick carrier on left billet. Sterling silver horn cap, string conchos; stirrup bolts; concho behind cantle, and horn cap. No. 5 mixed flower carving with dyed background. 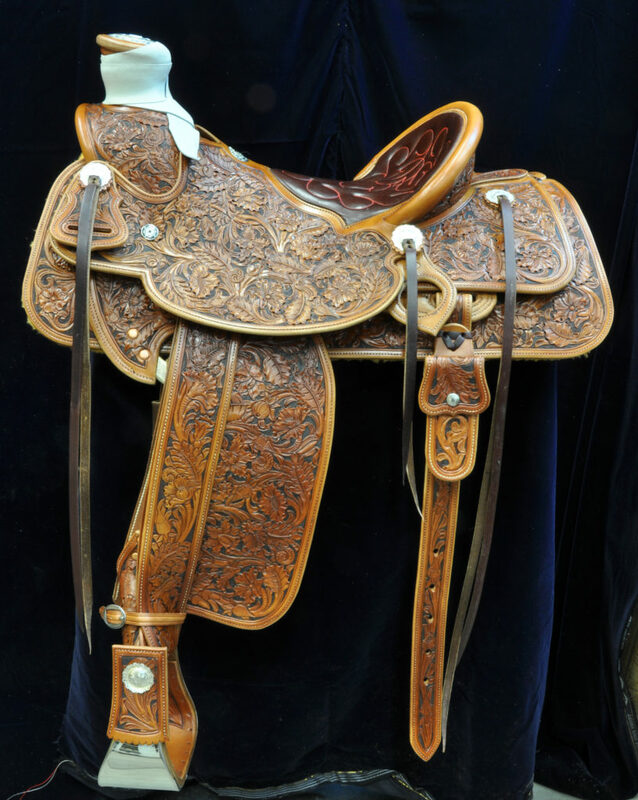 This saddle is built on the classic buckaroo tree, which goes back to the 1800s, when Visalia Stock Saddle Company was just entering its heyday. This fork can be made fork from 9 to 12 inches wide. 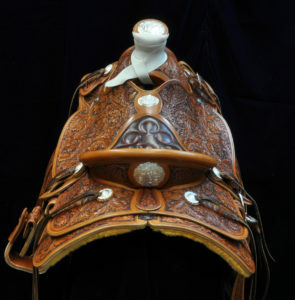 This saddle is vaquero-buckaroo outfit all the way through. No detail left overlooked, built to take the every wear and tear and still be eye-catching. Comfortable seats are the rule, built for long hours.